I have a featureless build I am doing using the Exile backfin w/thumb shelf on the MIAD grip, and I can't seem to find an Ambi safety that works comfortably with it. the right side of the Ambi safety interferes with where your thumb sits on the shelf when in the fire position and digs into the knuckle. Anyone find a solution for an ambi safety with a thumb shelf, or just stick with a non ambi mil spec safety? I use the full size lever on the right side. No issues with my thumb, but I'm sure our hands are different. The safety comes with a shortened/filleted option too. 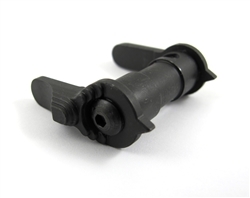 For an inexpensive option, Check out the $15 Joe Bob 60/90 ambi - the right side lever is scalloped pretty good and if you run it 60 it doesn't come down all the way. Otherwise you may have to look at pricier options that let you position the lever anyway you want, like the Sparrow selector. Here is the JB selector. I run them on a few guns, work great and price can't be beat for what you get. That's my recommendation. Fantastic piece of gear. The sparrow looks pretty neat. 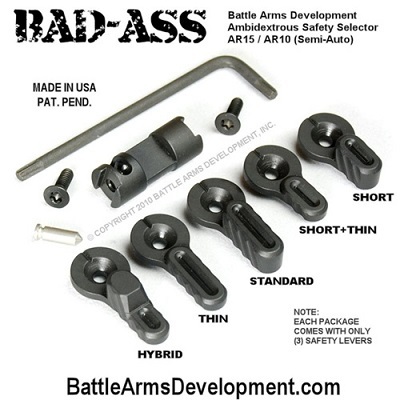 Alternatively you can look at the Battle Arms levers to see which one might work for you. They cost about $50-$60 for an ambi-set, and more if you want the 60-degree cant. Last edited by caliberetta; 04-15-2019 at 9:56 PM..
Battle Arms Development BAD-*** or BAD-CASS. You can choose the profile of the switch to meet your needs. I went with short and flat. I also have the Radian Talon ambi selector on another rifle and I actually really like it. I'm an equal opportunity shooter. Another vote for the Sparrow. Very adjustable and comes with the option for large or small lever. I prefer the large levers. I have three and love them. I used $13 Japanese ambi safeties with the Sparrow grips. They have a short right side lever and are cut smooth.